Real Mayonnaise is not white. Mayonnaise is most often made from egg yolks, oil, lemon juice, and mustard. None of which is white. Then, what is that in the grocery store that is white as snow? Companies are required to tell us the ingredients (though they are often coded), but not the processing procedures. Just like white stevia, something doesn’t seem right. Some companies use dehydration, while others use bleaching, and then reconstitution of dehydrated ingredients to create their overly processed mayonnaise. 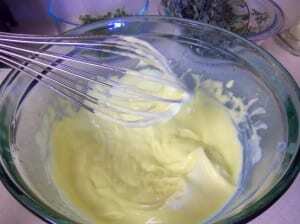 Real Homemade Mayonnaise will be yellow, a beautiful sunshine yellow, and taste amazingly fresh. If using olive oil, the color is even more rich. 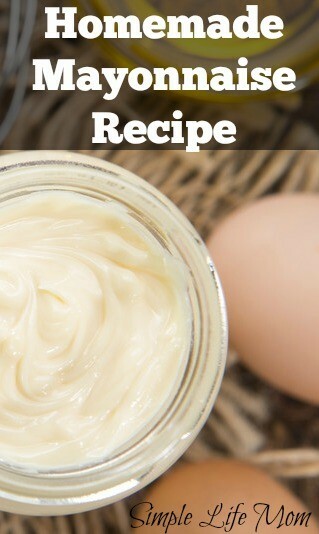 Here’s a recipe for quick, easy, delicious homemade mayonnaise where you know exactly what’s going in it and how it’s processed…by YOU. The key to making beautifully thick mayonnaise is adding the oil very slowly. You need to be very patient and drip the oil slowly. This will make all the difference in creating an optimal thickness and creamy texture. 1 to 1-1/2 cups oil of choice. In a bowl, whisk until slightly frothy and smooth the 2 egg yolks, mustard, salt, and acid of choice (lemon, red wine vinegar, or rice vinegar). Begin to add the oil of choice by dripping it in slowly. I like olive oil, but it definitely gives it a strong olive oil flavor. Once it starts to thicken you can add the oil a little faster. Whisk until all oil is incorporated. If too thick, add a little more acid (lemon juice). If too thin, add a little more oil. Hey Girk, mmm mmm good, bet this is heaven for a potato salad, will try and that makes sense, heaven knows what these supermarkets are selling us, best to stay to your own stuff you can make from scratch, plus the taste is so much yummier, thanks doll!!! Wow that is so easy! I don’t understand the obsession of whiter than white for food products. The very fact that some flour comes bleached should set off alarm bells! I’m sure they spend thousands of dollars on researching what people will buy, but people just need to be retrained not to buy just with their eyes. These days, anything brightly colored scares me!! You know it’s not real. I know there is a movement building against all the artificial stuff. Just wish it would build faster! I’ve never liked mayonnaise until I started making my own. 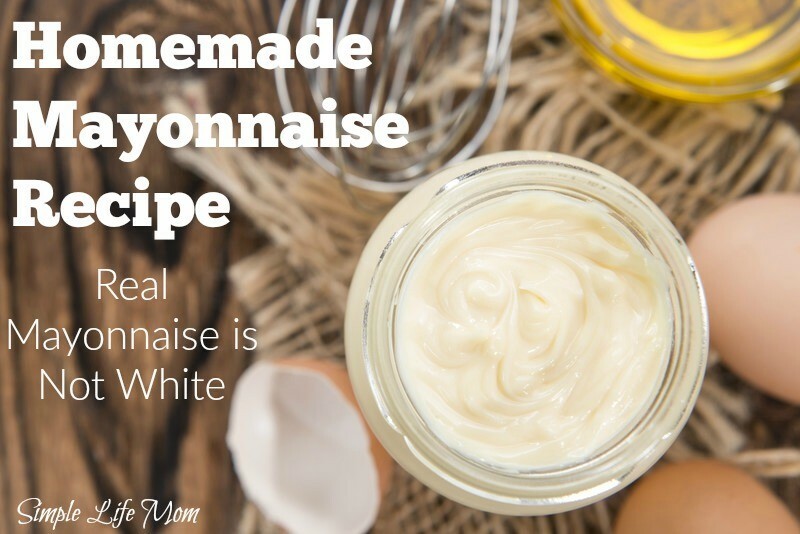 NOTHING beats a homemade mayonnaise. And I SO agree, something’s way off with the sparkling white mayo in the supermarket. I learned to make homemade mayonnaise when I was a child and your right it is not white or should any real mayonnaise be white. Thanks for sharing on Real Food Fridays Blog Hop! Real home-made mayo is so much better than the stuff you can pick up on grocery store shelves, but I think too often people are fearful of food poisoning. I am not a huge fan of mayonnaise, probably because of the grocery store stuff I grew up with, but found that experimenting with flavored aioli can real jazz up a dish! Would you have to worry about salmonella with this recipe? Just don’t leave it sitting out for over 2 hours.